Amanda Nadelberg is the author of Bright Brave Phenomena (Coffee House Press, 2012), Isa the Truck Named Isadore (Slope Editions, 2006), and a chapbook, Building Castles in Spain, Getting Married (The Song Cave, 2009). We went Behind the Sestina with Nadelberg to talk about her sestina, “My New Pet Word is Mozzarella,” featured in The Incredible Sestina Anthology. In College. My teacher used The Making of a Poem and lo and behold! Before, yes. Since: maybe not? I have probably written 4.5 sestinas in my life. 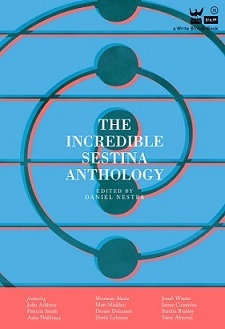 I would love to read the .5 sestina. Can you describe writing “My New Pet Word is Mozzarella”? Did the subject matter of the sestina have an impact on the form used, or did the form have an impact on what you were writing about? Its form drives the content most of all. It’s fine to have a nugget expectation of direction but after a while what I always forget I love about them is how you are bullied by these words into a narrative and sometimes it becomes a surprise, the direction taken. It would be fun to a write a sestina without a narrative. I’ve always enjoyed writing sestinas with end words that are seemingly “less expensive” (i.e. prepositions and articles are keys to the kingdom). Have you heard anyone use mozzarella as a pet name? How would define mozzarella as a verb? I haven’t. It could mean to tussle someone’s hair, as if an affectionate noogie; or it could mean to hurry up or to lie beneath a tree on a hot day. This entry was posted in Behind the Sestina and tagged amanda nadelberg, Arts, Behind the Sestina, Donald Duck, form, Incredible Sestina Anthology, mozzarella, my new pet word is mozzarella, Poetry, Sestina, The Incredible Sestina Anthology, Writing. Bookmark the permalink.